The first settler on the site of the Village of Columbiaville was Levi Cutting. He was a carpenter and cabinet maker by trade and in 1848 he erected the first home in Columbiaville, which is still standing at the south corner of Water and Lapeer Streets, as his residence. In 1848 a saw mill was built by George and Henry Niver, on the bank of the river. The town became known as Niverville until 1857, when the first post office was established. A town named Niverville existed in MI, so a new name was needed. Columbiaville was suggested by the Nivers, after their native county Columbia, NY. In 1850 a young man named William Peters came to Columbiaville to work for the Nivers in their sawmill. In 1852 he concluded to engage in business for himself and built a two story building at the corner of Lapeer and Middle Street, which he opened the first store. There after, Mr. Alfred Pettit builds a wagon shop, and later Reuben McArthur erected a building at the north end of of Lapeer Street for a store but did not use it. It was sold to John and Peter VanDyke who enlarged it and fitted it for a hotel. It was later sold to a man named Farrel and thus became called Farrel House. Later the name was changed to the Columbiaville Exchange owned by Elson Walt, later a Lapeer County Sheriff. The village continued to grow with the inclusion of a large Steam Grist and Flouring Mill, built by William Peters. The Detroit and Bay City Railroad chose to route through Columbiaville and was opened to the public in 1872. The first depot was a wooden structure located on the east side of the track at Pine Street. In 1893 the brick depot was erected by William Peter, with the provision is the deed that all passenger trains were to stop in Columbiaville. The railroad provided great means of transportation and opportunity for the village. In 1892 the Peters along with Toledo workmen, built the William Peters Mansion. They moved into the sixteen room Mansion in 1896. Mrs. Peters stated that the location of the home was chosen for convenience of being right downtown in the center of activity. Peters soon after became ill and died on October 23, 1899, at age 75. He is buried at Woodlawn Cemetery. 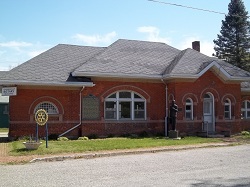 The Columbiaville Rotary Club was chartered on September 8,1947 and was sponsored by the Lapeer Rotary Club. Lewis Wood, Superintendent of Schools, was the first President. 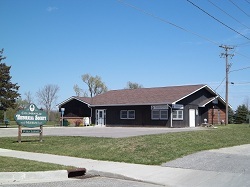 In 1960 the club purchased the Depot, remodeled it for use as a meeting place and made it available to the public. Through contacts in Rotary, the Modern Manufacturing Company moved it's factory into the Woolen Mill facility which has provided employment and has been a great asset to the community. The Rotary Club has participated in many activities in the community. Columbiaville has grown to become a close community with devoted residents, numerous family events, beautiful scenic views, and a great history, truly making it a 'nice place to have roots'.